We supply and install a huge variety of Overhead Cranes, Gantry Cranes and Crane Kits from leading manufacturers of the Lifting Industry. All of our equipment is supplied complete with the required certification, we can supply crane fully assembled, partly assembled or even pre-packed in export boxes ready to leave the country. Our company comes highly recommended from some of the worlds largest companies using industrial lifting equipment and Overhead Cranes which is attested in our Testimonials page. We operate in the Nuclear Industry, Gas Industry, Oil Industry, Hydroelectric Industry, Steel Industry and many more. Our company comes fully prepared with the necessary workforce and ISO 9001:2008 quality assurance certification to assure our customers with a globally recognised certification that your New Overhead Cranes are manufactured to the strict standards of our quality policy by manufacturers that meet our 'approved manufacturer' requirements. Cranes-UK offer New Overhead Cranes from only the top manufacturers with capacities up to 100 Tonnes, for details on pricing and installation please contact our friendly sales team who will be able to offer you a quotation. It is always ideal if you have a good idea of your requirements, however if you don't we can always arrange a site visit to suit you. Our international sales team offer a convenient export service on various types of New Overhead Cranes to all countries which offers various levels of service from packing and shipping to customs clearance abroad. Our convenient packing service which is available on some cranes features heavy duty, custom fabricated, heat treated wooden crates which are specifically designed to accommodate the crane(s) that has been purchased. Single Girder Overhead Cranes are ideal solutions to lifting most loads up to 16 Tonnes and spanning up to 40m in length. Perfectly suited to areas with low ceilings where maximum hook path must be achieved without the need for serious modifications to the existing building. Single girder cranes can be specified with dual speed operation just like other types of crane along with options for radio control and much more. 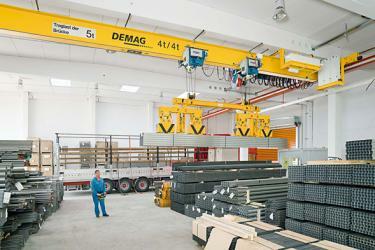 When ordering a single girder overhead crane you will have the option of an electric Wire Rope Hoist or Chain Hoist. Most customers using the crane for larger capacities or more frequently choose Wire Rope as this is a more durable and cost effective solution in the long term. The hoist travels along the bottom flange of the crane beam to give full coverage of the cranes span. If you can not read the word, click here. Electric Wire Rope Hoists from leading manufacturers at leading prices. We advise from the most comprehensive range of technologically advanced Wire Rope Hoists based on your specifications. New or Used up to 50 Tonnes in Monorail, Low Headroom and Crab Unit models for single and double girder overhead cranes. 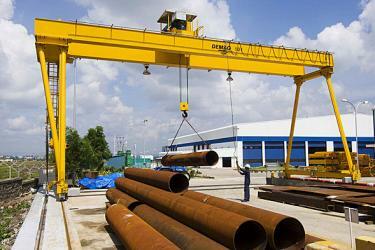 We also offer installation and servicing on all types of hoists. Electric Chain Hoists at the most competitive prices. Up to 30 Tonne capacities, our hoists are all superb quality and are manufactured FAST to your specification. 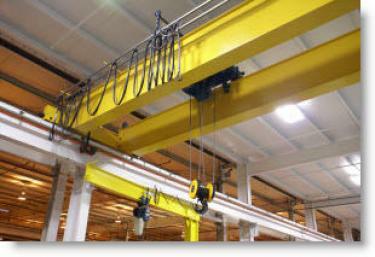 Overhead Crane Operator Training, On Site & For Up to 6 People. Fully LOLER and PUWER compliant Training. Inspection services from the experts, we offer testing, inspection, certification and reporting on all types of Overhead Cranes and associated Lifting Equipment. Remember: Maintenance Prevents Breakdowns. All of our maintenance is carried out in accordance with LOLER requirements by fully competent and trained engineers. Call our Service Department Today!